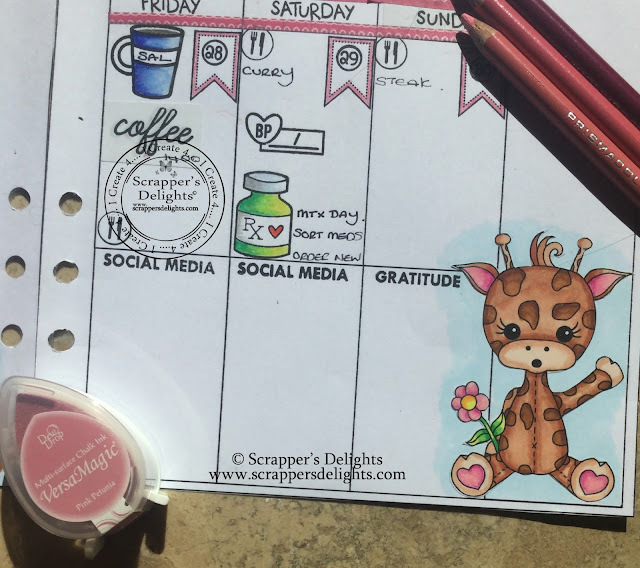 This week amongst other things I have been trying out the dedicated planner decoration kits that are being designed to specifically fit the Scrappers Delight digital planner. Currently there are 3 available and I think this is definitely a work in progress for Janice. These kits are `sized to fit` extension packs containing images, co-ordinating fill patterns, quotes, frames, checklists, icons and lots extras to fit the given theme. Each themed kit is available to fit either the large planner or the A5 planner. I have chosen to use some of the elements from the `giraffe` kit. 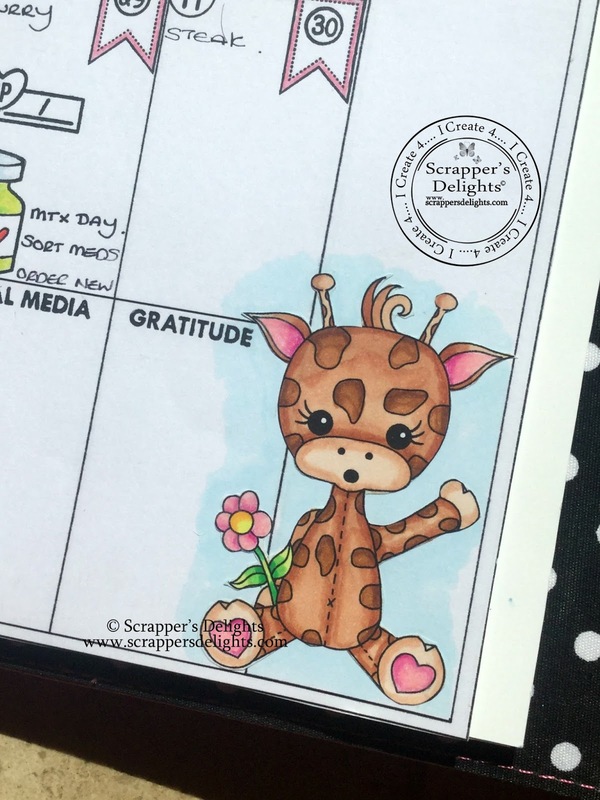 The giraffe himself has been printed on to sticker paper and coloured with copic pens before being fussy cut and applied to the base planner sheet. I have used co-ordinating washi tape and some of the flower icons to finish the main design. 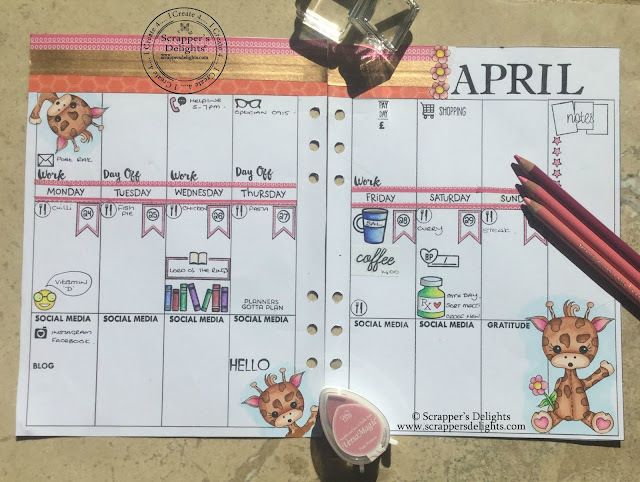 The other elements are all stamped direct to planner with an array of `planner stamps` from the usual companies (see below). This time I used a project life stamp too. I have always found the project life stamps a bit big but the April stamp works really well. As you can see I have left lots of writing room in my planner and this is because I will fill all the boxes. At the end of the week it will look very different with scribbled notes, doodles and anything else that makes its way in to the week. and see what the other design team ladies are up to. 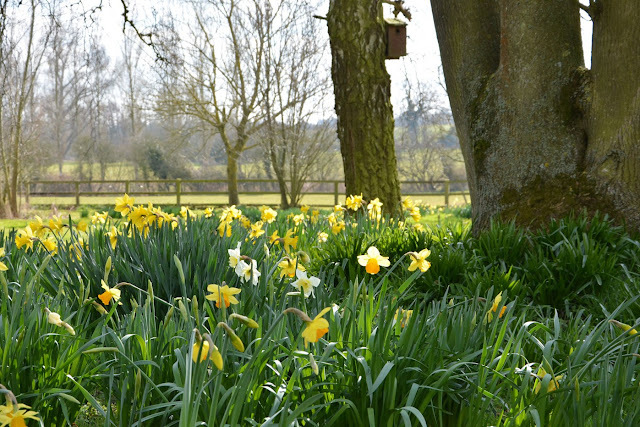 if you should place an order I would be really grateful if you would mention my blog.